In a collection of 14th c. legends about Francis, I Fioretti, each vignette is a clear echo of Francis’ spirit and personality, but these “little flowers” are hardly the stuff of cold hard fact. And that’s just right. For there’s nothing like a story to tell us the truth. Several of the fioretti involve animals. And miracles. Although not miracles so much as signs, like Jesus’ miracles were. Signs of the intentions of God to work life in the midst of death, draw joy from the wells of pain, make rich the poor, and refresh all creatures with freedom. Signs of a new heaven and a new earth, the Garden that was, and is, and is coming. In these stories when Francis speaks and acts, it is as if we are deposited in that Garden: humans and beasts are at ease with one another, the cosmos is attentive to God, and all created things are responsive to their charge to be creatures, and simply by being creatures to glorify God. And in this praising lies the simplicity and freedom of what some have called original blessing. The simplicity and freedom, the lightness that lifts the wings of birds and the hearts even of the poor. When Francis strides into a field—ragged, penniless, a man transported with joy that he is in infinite debt—and preaches that blessing to the birds, morning breaks like the first morning, blackbird speaks like the first bird. A short time after his conversion, Francis was uncertain about what he should do—whether to go apart from the world and devote himself only to prayer, or go into the world and preach the Gospel. And so he called Brother Masseo and said to him: “Go to Sister Clare, and ask her to pray that I may see clearly whether it is God’s will that I should preach. 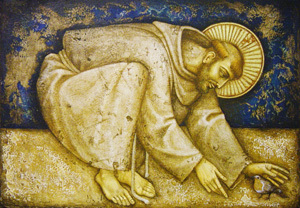 Then go to Brother Silvester, and ask him the same favor.” Brother Masseo did as St Francis said. Then, filled with joy, Francis got up, and said, “Let us go in the name of God!” He took Brother Masseo and Brother Agnolo and set out, but he did not choose the road: he let himself be guided by God’s Spirit. 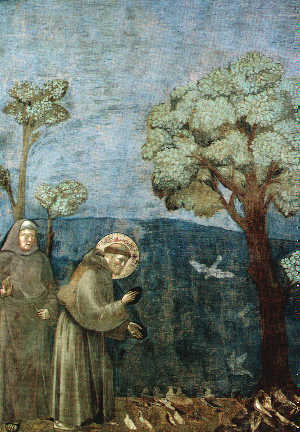 Along their way, Francis saw a great multitude of birds on some trees, and he was very taken with them. He said to his companions, “Wait for me here. I am going to preach to my little sisters the birds.” He set off into the field. There he began to preach to the birds on the ground, and all those on the trees also flocked to him. 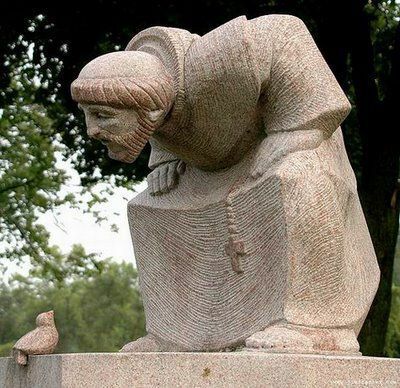 They listened attentively to Francis, and did not fly away until he had given them his blessing. Then the birds began to open their beaks, stretch their necks, spread their wings, and bow their heads, showing their joy by their movements and their songs. Francis rejoiced with them, giving thanks to the Creator. Then he made the sign of the cross, and let them fly away. All the birds rose into the air, singing. They divided themselves into four companies. One flew towards the east, another towards the west, one towards the south, and one towards the north; each company singing most wonderfully as it flew, encumbered by nothing; signifying that Francis and his brothers, and Clare and her sisters, like little birds, should possess nothing in this world, but should cast all the care of their lives on the goodness and providence of God.